Once considered to be non-existent in Angola, a new study reveals the country is home to Gabon vipers. Bitis Gabonica, commonly known as the Gabon viper, is a venomous viper species found in the rainforests and savannas of sub-Saharan Africa. It is not only the largest member of the genus bitis, but also the world’s heaviest viperid, and it has the longest fangs and the highest venom yield of any venomous snake. 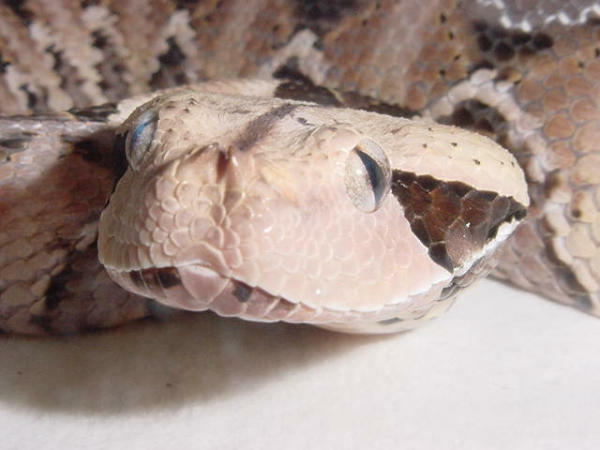 Angolan scientist Paula Regina de Oliveira said the species of Bitis Gabonica are the ones with teeth that could reach five centimeters long and larger glands, which allow them to accumulate large amounts of venom. Many years ago, I decided (to my own satisfaction) that although most caiman are hatched feisty, the 2 species of the so called dwarf caimans of the genus Paleosuchus are hatched actually evil. We see the smooth-fronted species, Paleosuchus trigonotus, on almost all of our trips to the Peruvian Amazon and no experiences I've had with them has altered my opinion in the least. In fact, if anything, my interactions involving this caiman, be they hatchlings or adults, have cemented my opinions ever more firmly. The scales of this brown-eyed caiman are heavily ossified, providing an alternate name of armored caiman. Comparatively small though they may be, these 4 to 6 foot long alligator relatives are strong, have very sharp teeth, immensely strong jaws, are perpetually ready to do battle, and our guides and I have learned to afford them much respect. A couple of years ago, a few early arriving clients (experienced herpers, all) got together on a rainy night before my arrival and decided to roadhunt the road to Nauta. After all, isn't that what herpers do? Somewhere along the way they encountered a 30 inch long smooth-fronted caiman, just sitting on the wet pavement minding its own business. They stopped to look at it. It looked like, with minimal repositioning it would make a fine photo. One of the group attempted to reposition the little beast with a stick only a few inches long. Now this would have been fine for a spotted salamander, but for a 30 inch smooth-front? Nope. It didn't work. Didn't even come close to working. And the result? Another herper learned respect for "little-but-feisty" beastie. I just wish I had been there to watch the action. It's always good to start a trip with a little entertainment. Continue reading "Beware of dwarf caimans"
Be sure to tell JonathanH you liked it here! Last month I visited Kerala, a south Indian state, with my friend and rescuing partner Axy (Akshay Parhalkar) and our teacher Mr. Iqbal Shaikh (a legend of Indian herpetology and holder of the title “snake man of India” during the 1970s) in search of King Cobra. We weren't lucky enough to find one, but still had some great experiences. It was the last day of our trip so we decided on a riverside jungle herping adventure. For the first two hours we were not able to find anything. Tired and exhausted, Axy and I decided to have a quick bath in the river. I still remember the lines said by Sir, "Don’t go too far, as I have a strong feeling that we’ll get something at the river bank only." Keeping that in mind, we were swimming close to the riverbank and suddenly we heard some villagers shouting, "Snake snake." Hearing that word, Axy and I ran and jumped between the huge river rocks towards the direction of the crowd. After reaching the spot we realized that both of us forgot to wear our clothes and we were just wearing our boxers/underwear, but we didn’t let it bother us and continued with our task. It was a fat and healthy 8-foot Indian rat snake trying to hide under a rock, so I pulled it out gently. It didn’t take much time for the snake to turn into an aggressive creature, so we decided to do a head catch. It was a strong snake so it was a bit difficult for head catch and Axy got bitten while doing the head catch. After making the snake calm we got dressed and clicked some photographs. The most embarrassing and funny part of this incident was that we were watched and clicked by more than 20 villagers during the task when both of us were "almost naked." This incident still makes us laugh and it adds an unforgettable experience to my life. The Florida Fish and Wildlife Conservation Commission is offering workshops to help people identify and report Burmese pythons, but not everyone agrees that the pythons are a problem. "This horse has been beat so many times," said Eugene Bessette, commercial snake breeder and owner of Ophiological Services, a snake farm on Archer Road. Even though Burmese pythons are not indigenous to South Florida, Bessette said he feels they are ultimately not an ecological problem. "Ignorance is the biggest problem," Bessette said. “People form opinions before they get the facts." 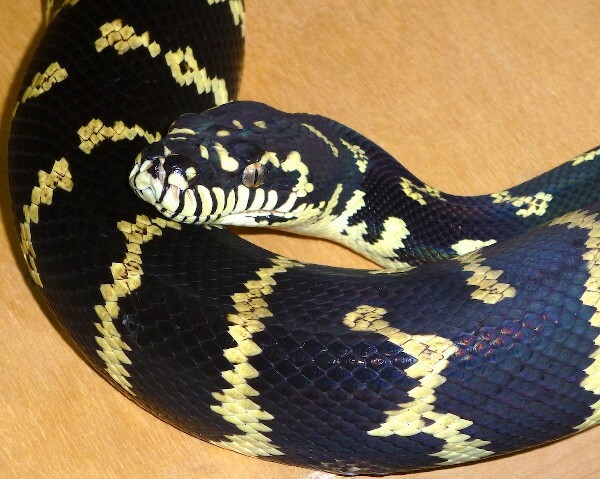 Bessette lost a substantial part of his business when new regulations put in place in 2012 banned the importation and interstate transportation of Burmese pythons and three other constrictor snakes. 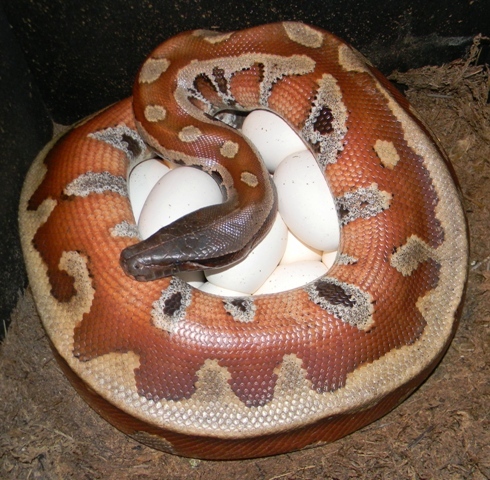 This big mama blood python is holding tight to her eggs in our herp photo of the day, uploaded by kingsnake.com user AJ01! Be sure to tell AJ01 you liked it here!